Time to Party – new CD album, new music! This new Mickey’s Magical Party CD album was first confirmed in DLRP Magic.com‘s exclusive interview with Director of Music Vasile Sirli back in July, with an expected release for August. On the disc you’ll find pretty much the full original score of the centrepiece show It’s Party Time… with Mickey and Friends, plus two new versions of the ‘Mickey’s Magical Party Time’ theme song by Scott Erickson and the ‘He’s a Pirate’ (a track from the original Pirates of the Caribbean: The Curse of the Black Pearl soundtrack) remix heard at the start of It’s Dance Time… in Discoveryland. Tracks marked with an asterisk (*) are included in the preview above. With a running time of just over 50 minutes and over 20 of those taken up by the final filler tracks, it’s still notable what this CD celebration of the year’s events fails to include — besides the Mickey’s Magical Party Time song itself, which you’ll have to buy on the separate CD single. Still we’ve no ‘Tous en Train’ theme song from Minnie’s Party Train and Disney Characters’ Express, nor any music from the new attractions over at Walt Disney Studios Park. Playhouse Disney is excusable since the rights are held elsewhere, but a ‘Roll out the Red Carpet’ mix from Disney’s Stars ‘n’ Cars could have been a good inclusion, perhaps the ‘Showbiz Suite’ version previously released for the parade at Walt Disney World. Goofy’s Summer Camp has also provided another remix of the main theme song played before the show begins in a laid-back country style, which may well have been cut too late to make the master. But, who cares? Have you listened to those preview clips above yet, or seen the ‘Party Time’ show in the park itself? The score of this show, particularly the opening and finale, is a sensational piece of work from Vasile Sirli. Incorporating musical styles and instruments from across Europe to give the classic Disney themes a fresh and vibrant new feel, not to mention a glorious, rich orchestral version of the theme song, it’s one of the best Disney entertainment scores of the decade. And now, we can own it. The CD is priced at €15.00, and now available for sure at The Storybook Store and The Emporium, though may well have found its way to more locations. Grab it quick, though — we’re nearly half way through the year already and in its first days on sale (particularly over the final weekend of August), the small displays at these stores were being emptied each day. • You can also order the CD via the resort’s official mail order service. 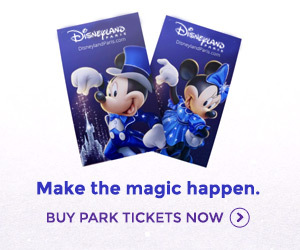 Email dlp.mail.order@disney.com for more details. Pictures: DLRP Today.com; Music: © Disney. im off to experience mickeys magical party in two weeks time…i must say listening to these excerpts has made me a lot more excited about it. i havent been too keen to see the new shows after reading about them on here, but by the sound of things the music alone will make it worthwhile. even in these short clips you can hear different influences coming in from around the world – cant wait to hear the real thing and i will definitely be buying the cd!